Today's gift idea is something that every book lover needs - adhesive book plates. How many times have you borrowed a book from someone only to forget who you borrowed it from a month later? Or forgot a book at a friend's house and lost it forever because they didn't know whose it was. It's a vicious cycle and one that can easily be broken with these Katie Crawford adhesive book plates. What are book plates you ask? They are an easy way to put your information in each of your books, especially if they are adhesive like these ones are. Peel and stick. And no more losing your books. Each colorful bookplate measures approximately 2.5 x 3.5" and is printed on matte, easy-to-write-on sticker paper. The six designs included in this set are Sweater Mouse, Brown Owl, Green Dinosaur, Dapper Skeleton, Rainbow Cloud, and Retro Trees. 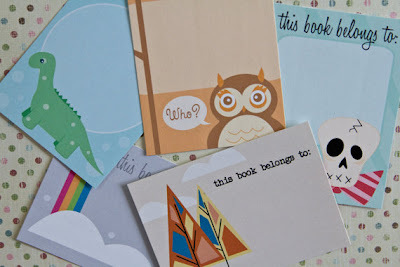 Katie has generously offered to give away two sets of six colorful bookplates to Book Nook Club readers, your choice from her cute designs. In addition to cute bookplates, Katie also designs gorgeous invitations and e-vites. Check out Katie Crawford designs and tell me which of her products you like best. 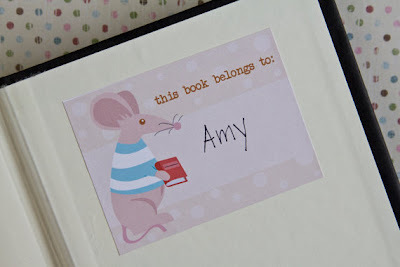 Giveaway prize includes one set of six adhesive bookplates and shipping. I love the Dapper Skeleton Set of 6 Note Cards. This is amazing and will for sure be a huge help when borrowing books!! I'm bound to win ONE giveaway... maybe this one?! My fave is the I heart you love robot card. Beautiful and clever designs! What a great giveaway!! I could really use some of these. It would make my son feel so great if his book had a nice place that said his name!